Love these old comic ads! 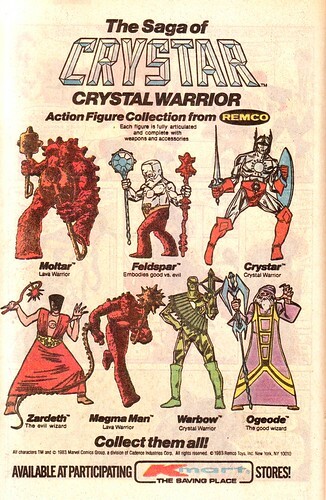 Still looking for a mint-complete Crystar m'self. God I loved this line. I wish they would remake these. I live clear figures for some reason. First the odds ands ends and now this! Stop tempting me! Lol,I like the ads more than the actual figures since the artwork makes my imagination fly like with the Sgt.Rock and Warlord figures. Yeah, if I had the cash I'd totally nab a Moltar off eBay. Man, this takes me back. So much potential, so little time to gain a following. Crystar was an awesome concept that needs revisiting.